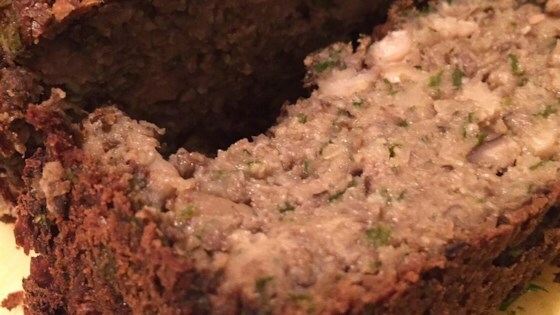 "This loaf is great for those who love the flavor of falafel. The leftovers also make great sandwiches!" Preheat oven to 350 degrees F (175 degrees C). Lightly grease a loaf pan with cooking spray. Combine cremini mushrooms, shiitake mushrooms, onion, cumin, coriander, garlic, and cardamom in a large bowl. Place half of the mushroom mixture in a food processor; pulse until coarsely chopped. Repeat with remaining mushroom mixture. Heat 1 tablespoon oil in a large skillet over medium-high heat. Add half of the chopped mushroom mixture; cook, stirring occasionally, until the edges begin to crisp, about 5 minutes. Transfer to a bowl. Repeat with remaining oil and mushroom mixture. Pulse cannellini beans in the food processor until coarsely chopped; add to the bowl with cooked mushroom mixture. Add falafel mix, cilantro, parsley, egg, and salt. Stir gently to combine. Spoon mixture into the prepared loaf pan. Bake in the preheated oven until edges are browned and the center is completely set, 75 to 90 minutes. Cool pan on a wire rack, about 30 minutes. Invert onto a cutting board and slice. See how to make a flavorful veggie burger that’s never dry. Substitute chickpeas for the cannellini beans if desired.